This special bracket allows you to mount the parallettes on the wall or ceiling and can be used as a pull up bar. Fastening is simple as the minibar slides in sideways into the bracket and secured with two magnetic snatches. This way the parallettes are interlocked securely in all directions and can take heavy strains. The brackets are made out of untreated birch plywood. Due to the heights of the parallettes, the wall brackets don't necessarily have to be mounted above a door frame. 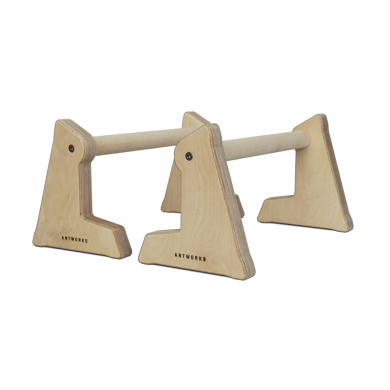 With a distance to the wall of 255mm, the parallettes can still be used for pull-ups or grip strength training, when mounted directly to the wall. It is important to have a very even surface for mounting the Base A. The play between parallettes and brackets are just a few tenths of a millimeter, a lopsided base can lead to the bar not sliding into the bracket properly. There are two instructions on how to mount the bracket onto an even and an undulated base. Some manual dexterity is needed, or ask someone for help.